A representative beautiful 8 garden that is typical of Hokkaido is concentrated, It is a highway connecting the heavy snow ~ Furano ~ Tokachi about 2 X NUMX 0 km. Both of these gardens are modern day tourist gardens that develops gardens and scenery filled with power, full of individuality, taking advantage of Hokkaido's unique climate and landscape. It is suitable for calling Japan's Cotswolds (UK garden area) and romantic highway (one of German sightseeing roads), to build a new Japanese garden culture. Moreover, it is a sightseeing route that you can enjoy activities with natural landscapes and mountain ranges and enjoy rich food. In French vert (green) will turn green. There is also a meaning to say "youthful" or "energetic". Today, traveling to sightseeing spots such as green tourism, agriculture tourism, ecotourism, etc. and having a relaxing time, traveling with industries and people in the area is starting to attract attention. Many spots where Asahikawa, Furano, Tokachi can experience beautiful gardens and rich natural environment are scattered. 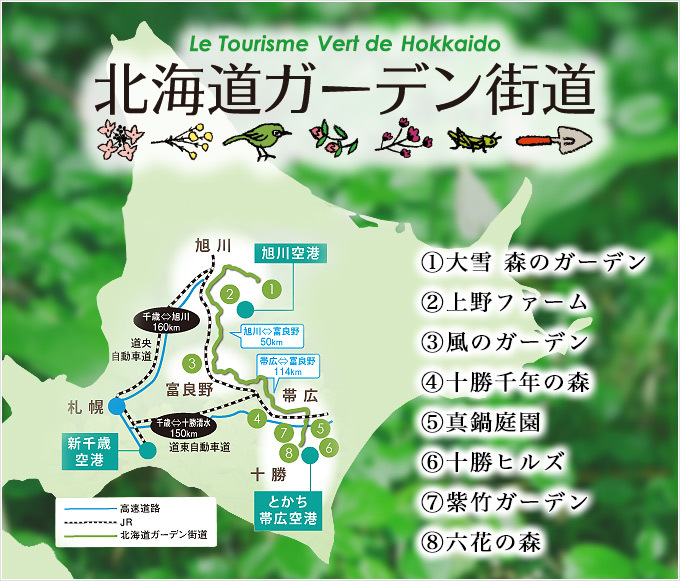 We aim to establish this tourist route and enhance recognition by providing more attractive "tourism · veil" by connecting this 3 region with the charm unique to Hokkaido and having cooperation.